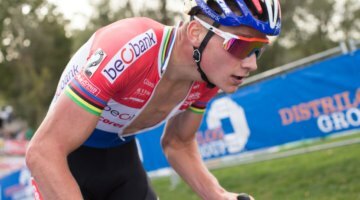 Would Mathieu van der Poel (Corendon – Circus) take victory number 30 of the season? That was the question on the line at Superprestige Hoogstraten on Sunday. A muddy track with tricky descents and an off-camber awaited the riders in the Belgian town of Hoogstraten. Whoever won today’s “Strawberry Cross” would definitely go home with a box of strawberries. For Van der Poel, when you’ve won 29 races and have a comfortable lead in the Superprestige Classification, motivation can come in different shapes. Aerts was second in that classification, but 10 points behind van der Poel, who had the maximum of the points after winning all six of the Superprestige races this season. In his pre-race interview, Van der Poel told Telenet that he would maybe ride more economically than in yesterday’s race, where he tried to have a fast start in order to pass the intermediate point in first position, so he could have the 15 bonus seconds and the €2,500 price. Quinten Hermans (Telenet Fidea Lions) was the rider with today’s fast start. In the first corner, a few riders crashed. Czech champion Michael Boros (Creafin TUV Sud), among others, was one of the victims. When the lead group hit the pit area, Hermans and Michael Vanthourenhout (Marlux – Bingoal) had the lead with a small gap on Laurens Sweeck (Pauwels Sauzen – Vastgoedservice) and Gianni Vermeersch (Steylaerts – 777). A lot of riders ran over today’s barriers on the muddy track, but acrobat Van der Poel bunny-hopped the planks, closed the gap on Sweeck and Vermeersch, passed them and started to close the gap on the two leaders. On today’s off-camber, the solution seemed to be running. Sweeck tried to ride the first trip through but that didn’t seem the best decision. At the end of the first of eight laps, Van der Poel closed the gap and joined two leaders. Early in the second lap, the pace of the three-headed leading group dropped which allowed Aerts, among others, to come back. On the off-camber, Vanthourenhout got into trouble. He got stuck in the track’s border and lost valuable time. Vanthourenhout’s misfortune dropped the lead selection to Aerts, Van der Poel and Hermans entering the third lap. In that circuit, Eli Iserbyt (Marlux – Bingoal) joined as well. Later in Lap 3, a split in the lead group occurred. Van der Poel accelerated to put pressure on the other riders. Iserbyt hooked to a pole and Hermans couldn’t keep up with the pace. 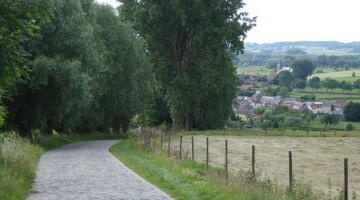 Crossing the line, Van der Poel and Aerts had a 13 seconds advantage on Hermans, who was joined in the meantime by teammate Corne van Kessel (Telenet Fidea Lions). Iserbyt was in fifth position on 17 seconds. In the background, David van der Poel (Corendon – Circus) crashed hard, and first responders tried to keep him warm before taking him off the course. On the same spot where the World Champion’s older brother crashed, Vermeersch went a little later as well when his handlebars got stuck in the track’s border. Towards the end of the fourth lap, Van der Poel rode the off-camber. Apparently, the off-camber was ridable after all. Aerts, however, had to run and had a six seconds arrears entering the fifth lap. Van der Poel changed bikes at Pit 1 though, which allowed Aerts to come back. Iserbyt, van Kessel and Hermans formed the chasing group. At the end of the fifth lap, they were 28 seconds behind. Aerts’ maintained his pre-race goal of sticking with the World Champion until the sixth lap. Then, he crashed taking a corner following a rut in the mud. Van der Poel didn’t wait. Later in that lap, Aerts, who probably tried to close the gap a little too fast, took a line that led him too wide through a corner, which made him lose even more time. At the end of six, Van der Poel had a 14-second advantage on Aerts and a 48-second advantage on Van Kessel, who was about to be joined by Iserbyt. In a descent that claimed Denise Betsema in the earlier Elite Women’s race, Aerts again made a mistake, setting him back by 23 seconds at the bell. It seemed Van der Poel was going to take his 30th victory of the season. The battle for third place was going to be fought between Van Kessel and Iserbyt, who were already more than a minute behind. During the last lap, Aerts crashed again. Van der Poel didn’t take any risks and ran over the barriers. Aerts, who turned his eyes toward the chasers in third, did the same thing. Van Kessel tried to get rid of Iserbyt and bunny-hopped. Iserbyt, who also wanted to go on the podium, did the same thing. Van der Poel, who showed his mastery again when he managed to ride the off-camber for a second time, won his 30th race of the 2018/19 season. Aerts finished second on 37 seconds. Van Kessel won the battle for the last spot on the podium and finished third on 54 seconds. 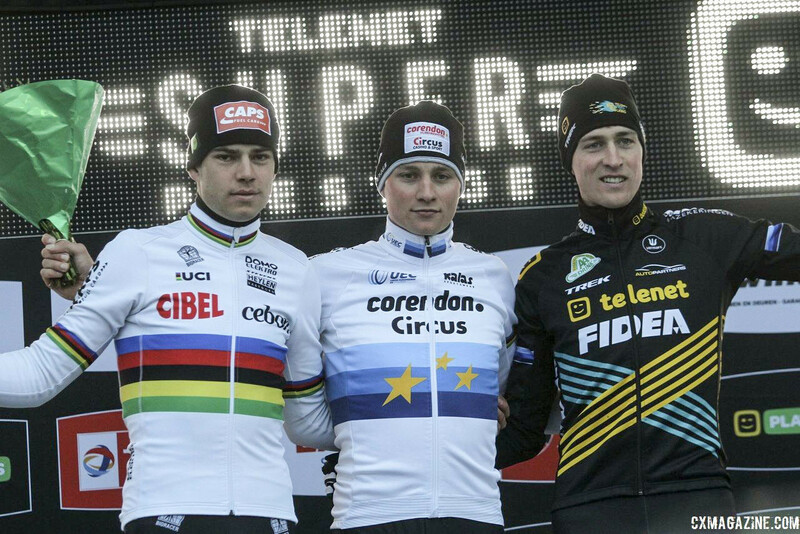 Van der Poel fortified his lead in the Superprestige classification and now has an 11-point advantage on Aerts. The max score for any race is 15 points, so Aerts needs a minor miracle to beat Van der Poel in the series overall. Canadian rider Michael van den Ham (Garneau – Easton p/b Transitions LifeCare) finished 30th as first Northern American rider. Kerry Werner (Kona Maxxis Shimano) finished 32nd as first American rider. Eric Thompson (MSpeedwax.com) finished 37th, Andrew Juiliano (GritWorld Racing p/b Voler) 43rd and Dylan Postier (Garneau – Easton p/b Transitions LifeCare) 48th. Next post Wout ’Cross Watch: Van Aert to Return to Cyclocross in 2019/20?